It is next to impossible to find the big Russet Idaho baker potatoes in Idaho grocery stores. Depending on who you ask, the blame either falls on the Idaho Potato Commission or the retailers who sell potatoes at their stores. “It’s my understanding it’s because they ship them all to back East,” said Mike Peer, manager of Rosauers in Lewiston, expressing a widely held notion among Idaho sellers and consumers. Rosauers doesn’t carry the big bakers and Peer doesn’t know if he could get them if he tried. Jeweldean Hull of the Idaho Potato Commission in Meridian has a different story. 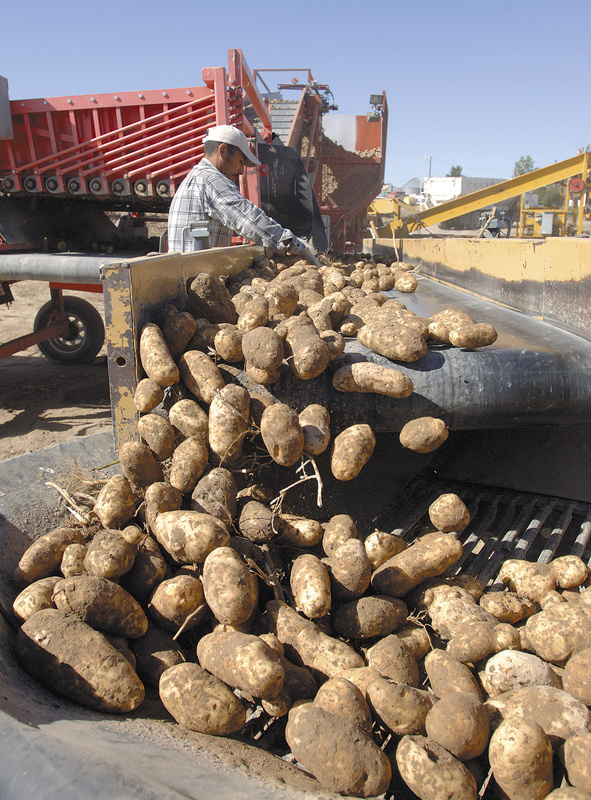 According to the National Potato Council, Idaho is the top potato-producing state in the country with 14.2 billion pounds produced each year. Washington is the second-largest producer with 9.6 billion pounds per year. New York is the biggest importer of Idaho potatoes. There are a number of varieties of potatoes grown in Idaho, but 60 percent are Russet Burbanks, also known as the big baker variety. Even though potatoes are mostly a Southern Idaho crop nowadays, the first potatoes in Idaho were grown in 1837 near Lapwai, about 10 miles from Lewiston. According to “Aristocrat in Burlap,” a history of the potato in Idaho by James W. Davis, Presbyterian missionary Henry Spalding had a disappointing try at using his trail horses to plow the ground and plant a garden. The Nez Perce Indians saw his predicament and offered to break the ground by hand and planted several acres of potatoes. The Nez Perce probably were the first potato merchants, according to the book, by trading fresh potatoes to the immigrants traveling in wagon trains for clothing and other goods the Indians wanted. The fledgling potato industry was abandoned, however, in 1850 when Spalding was forced to flee the area following the Whitman missionary massacre. The famous Russet Burbank, known for its large size and white, mealy interior, was developed in 1872 by Luther Burbank. Don Odiorne, vice president of food service for the potato commission, said Burbank, the plant scientist who also developed the Shasta daisy, was told by his doctor to move from New England to the West because of failing health. To get the money for his move, Odiorne said, Burbank sold some potatoes and kept some seeds for the trip to Colorado and then to the West Coast. The variety Burbank saved was the Russet Burbank, which made Idaho famous. Unlike the small Irish potatoes Western farmers were used to growing, the Russet Burbank was huge. Paradoxically, the Russets were spurned by chefs and other buyers because they were too big to serve on the fine china plates then popular in the leading gourmet restaurants of New York and San Francisco. But Hazen Titus, a dining car superintendent of the Northern Pacific Railway, was talking to local farmers during a stopover in the Yakima Valley and discovered the farmers were facing a crop failure because the potatoes were too big to sell. Titus looked at the giant 2-plus-pound potatoes and “saw a way to spread the fame of the Great Northern rail route to the whole nation and beyond,” according to an article by historian Ana Kinkaid. Today there are more than 30 varieties of potatoes grown in Idaho, but the Russet Burbank, also known from coast to coast as the Great Idaho Potato, is still king. “Russets are very popular because we all grew up on them,” said Nora Olsen, the University of Idaho’s extension potato specialist and past president of the Potato Association of America. The Russet Burbank is also the main potato used for French fries, tots and chips. But as consumers become more food-wise, they also are asking for different varieties of potatoes and to know more about the ones they serve. “The Yukon Gold came up and flared up the market,” for example, Olsen said. Some of the changes in the potato industry include advertising the names of new varieties and the nutritional benefits of each one. Some potatoes may be higher in vitamin C or in antioxidants. Olsen said researchers continue to look for ways to reduce the cost of raising potatoes. Russets, for example, are prone to climate stress, so current research is focusing on making them hardier or developing new varieties that hold up well in times of drought.